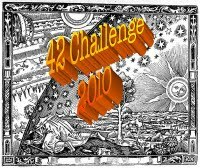 You are currently browsing the tag archive for the ‘42 Challenge’ tag. This is without doubt a beautifully written book. I finished it a while ago and have been mulling it over ever since, wondering what I could actually say about it without diminishing what was a truly lovely reading experience. 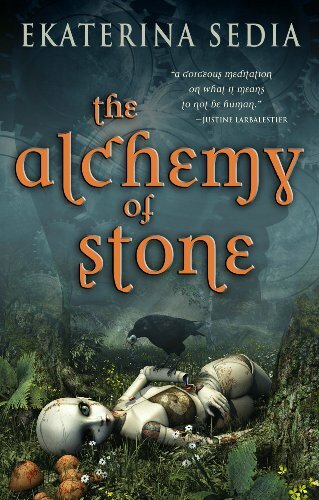 The Alchemy of Stone tells the story of Mattie, an automaton who has become emancipated (up to a point) and who has trained as an alchemist. It’s a dysfunctional society in which she lives, of Alchemists versus Mechanics, each with their own views on how the city should be run, and an underclass which appears to be rising up to overthrow the existing order. Mattie treads a fine line between maintaining her independence and the need to find a way to get the thing she needs from the mechanic who made her – Loharri, who, though ostensibly letting her go, still holds the key which winds her heart. I won’t say any more about the story itself, but it’s worth dwelling on the themes which develop within it. And a man who absorbs the souls of the dead, who can still speak through him. It’s steampunk at its best, with a main character of real substance, and an ending that I found moving, heart-breaking but also hopeful. Seriously recommended. And if you’re not sure just look at Carl’s review here. Which has the wonderful cover that originally drew me to finding out about this book, though I’ve come to love the one on mine more. I thought this was just lovely and am so glad that I was finally able to get my hands on a copy. It is a month for favourites – Charles Stross is rapidly becoming one of the authors I leap upon (metaphorically speaking of course) as soon as something new comes out (we have lots of his stuff in the house but I am trying not to gorge myself as he is far too good to be wasted in that way) and Lee Gibbons is becoming one of my favourite sci-fi cover artists. 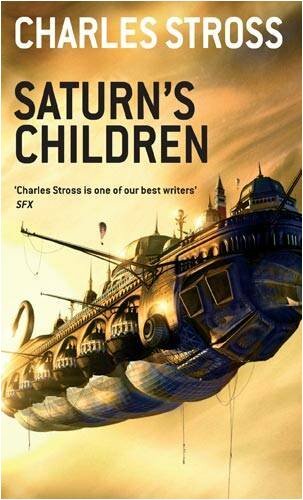 So Saturn’s Children is yet more space opera with a strong female lead and an extremely interesting premise, so there was no way that I was going to dislike this novel, which is a really good thriller as well as a sci-fi tale. Freya Nakamachi-47 is a cloned synthetic person, designed to be a concubine for humans, but activated long after the human race has totally died out. The robots, for want of a better word, have built their own society which unfortunately has taken on many of the worst aspects of how humans behaved – rigidly hierarchical with everything from aristocrats to slaves, overly legalistic and potentially very harsh. Freya gets into trouble on Venus and needs to get off-planet very quickly; to do so she takes on a job as a courier, taking contraband from Mercury to Mars. Of course, this all goes a bit pear-shaped as you might expect, and Freya’s troubles multiply as she tries to find out what’s going on, and in particular who wants to kill her. I really enjoyed this – it’s very funny in places, the thriller bits are thrilling, Freya is a likeable character in difficult circumstances and the story had a nice pay-off as far as I was concerned. Some of the funniest parts relate to the horrors of interplanetary travel – basically not a lot of fun, takes ages, is expensive and passengers often don’t survive. The variety of robot entities, some more humanoid than others, really add to the offbeat alienness of a non-human society. And there are a number of really cool spaceships. 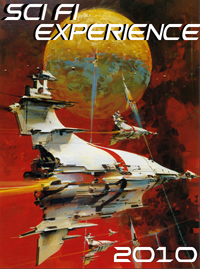 This is another read for the 42 Challenge, and the Sc-fi experience 2010. So Gary Gibson was my big find of last year (well, I didn’t exactly find him, I was pointed in his direction by the Book God) and Stealing Light one of my favourite reads. 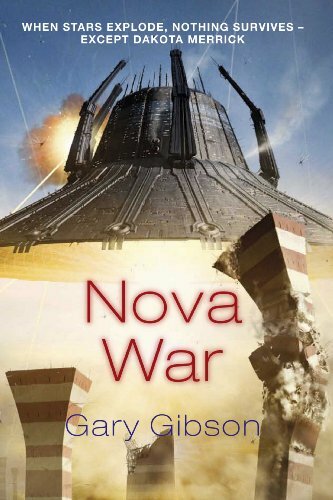 So anticipation was high for Nova War and it didn’t disappoint. But it’s going to be difficult to review here because it is a straight sequel (part of the Shoal sequence, the third volume comes out later this year) and so any in-depth discussion would give away details of the outcome of the first book, and I wouldn’t want to do that because it was huge fun to read and I don’t want to spoil it for anyone likely to give it a go. So what do you need to know? Well, it’s a space opera (hurrah! I’m a sucker for those) with a couple of strong central characters, a convincing range of truly alien alien races (the Emissaries being particular favourites for their sheer nastiness), fantastic spaceships, revelations, war, realpolitik and (yay!) exploding suns. I absolutely loved it from the Lee Gibbons cover to the set-up for book three. I strongly identified with at least one of the main characters (is it too much to say that Dakota Merrick survives from book one ? Probably not given that she is the heroine after all), actually felt a tiny wee bit of sympathy for one of the villains (we find out what was done to him in the past to make him who he is now and it is truly terrible – sympathy doesn’t last that long, though) and just enjoyed the whole big-wide-world-of-spacefaring thing that was going on. What can I say? I just can’t resist hard SF. An excuse to read comics (as if I needed one), an excuse to frequent Forbidden Planet even more than I do now (as if I needed one of those either), and excuse to re-read The Sandman (and to persuade Silvery Dude to have a go at volume 2). Sounds like a plan to me..
42 sci-fi things in 42 weeks. Irresistible, did quite well last year, one of the few that I managed to finish, lots to read and watch so hopeful of an equally good result this year. Not making a list, far too much to ponder on, but at the very least Dr Who: The End of Time will be near the top…. And last but my no means least, a companion to The 42 is Carl’s Sci-Fi Experience 2010, an excuse to wallow in all things sc-fi for a couple of months. Again, not planning to make a list but I’ll just see what takes my fancy…. So I’ve now seen the one before the one before the last ever David Tennant episode. And lo, it was remarkable, and worth waiting for. As I try, and fail, to explain here. Or the non-science-fiction-science fiction one. So this is the latest from the great Iain Banks, one of my favourite authors. In the US (and possibly elsewhere, I’m not absolutely sure) this is being marketed as a science fiction novel, but not here in the UK where it’s being positioned as a mainstream novel which kind of has sci-fi overtones. I heard Mr B being interviewed on Simon Mayo’s radio programme some weeks ago and this was touched on, and he seems to regard Transition as non-sci-fi. Although I’m only a reader, I beg to differ…. The multiple universes, the mechanisms for travelling between them, and the all-powerful Concern all push me towards the sci-fi view. However you could see it as it’s described in the blurb which explains it as a “high-definition, hyper-real, apocalyptic fable” and a great deal of the action does take place in “our” world, in the period between the fall of the Berlin Wall and the attack on the Twin Towers. But an awful lot of it doesn’t….. But setting all of that aside, it is a really absorbing story of politics and greed and paranoia and terrorism and torture and parallel worlds and I thoroughly enjoyed it. I particularly liked The Transitionary (which is probably just as well) moving between worlds and interfering in various ways for the greater good (or is he?) and Mrs Mulverhill and her habit of wearing small hats with veils, a style I never managed to pull off in the ten minutes when it was fashionable in the eighties. The structure of the novel, using multiple narrators really worked for me as well given the subject matter of the story, and although I had to read the end a couple of times to make sure I really had understood it, I found it a satisfying read. And I don’t care, I’m going to claim this for the 42 Challenge. Can’t wait until the next Culture novel, though. So we find ourselves in an alternative 21st century, one where Germany won the First World War and the Ottoman Empire still exists. Ashraf Bey is the son of an American photographer and apparently the Emir of Tunis, though his mother always told him his Dad was a Swiss watchmaker or something. Anyhow, Raf is on the run from prison near Seattle where he was serving time for a murder he probably didn’t commit, and has been summoned to El Iskandryia (alternative world Alexandria) by an aunt he didn’t know existed, and is to be married off for money. For he is pashazade, a member of the aristocracy with a diplomatic passport and extremely eligible as a husband for the daughter of a man climbing his way up the social ladder. But of course it doesn’t work out quite like that. His aunt is murdered, he is the prime suspect and of course that means he has to go on the run again, relying as much as he can on the help, reluctant or otherwise, of Felix (an expatriate American policeman), Zara (the woman whose hand in marriage he has rejected) and Hani (his nine year old niece). All while trying to identify both the killer and the motive and clear his own name. I really enjoyed this, because it brings together two things I love – science fiction and crime – and does so very successfully. The sci-fi is quite light, the world of El Iskandryia is not so far away from our own that its unrecognisable, but still sufficiently different that you know we are in an alternative time-line. The mystery is well done; didn’t guess the murderer this time but you can’t win them all. It works because Raf himself is an ambivalent and attractive character and its easy to root for him. This is the first of a trilogy and I am looking forward to reading the sequels. I had the great pleasure of watching the latest Dr Who episode, Planet of the Dead, at the weekend as part of the 42 Challenge, and thoroughly good it was too. My review is here, along with some stuff about the remaining Tennant era stories. Halting State is only my second Charles Stross novel but I think it’s already clear that he and I are going to have a long and productive relationship as I’ve thoroughly enjoyed both reads so far (see this review for my previous foray). So we are in Edinburgh and Sergeant Sue Smith has been called to the office of Hayek Associates, a company which produces and supports online games. There has been a robbery, but not one of your usual smash and grabs; this time the robbery has taken place inside a game, and has been carried out by a marauding but organised band of orcs, supported by a dragon. Add to this mix Elaine Barnaby, a forensic accountant with practical skills in weilding very large swords in medieval role playing games, and Jack Reed, a games programmer who just happens to be unemployed at the right time and with the right skills set to assist in the investigation, and you have the three main characters in a tale of gaming, programming and international terrorism in a 21st century which is a bit of an advance on the one we recognise. And one of the questions is: when is a game not a game? I loved this; I’ll admit it took me a day or two of typical reading-on-the-train commuter time to really get into the story but once I was housebound with the dreaded Head Cold 2: This Time It’s Personal, this book was exactly what I needed to escape from the depths of feeling sorry for myself. And what more can you ask? I’ve never played World of Warcraft or any of its competitors but I can see the attraction it has, and although I’m sure you would get a lot of additional pleasure out of this story if you had a background in online gaming, I found I knew enough to make the story intelligible. The techy stuff was really interesting and was very happy with how the plot all worked out in the end. Another recommendation, and another read for the 42 Challenge. Gregory Benford’s Eater is, according to the cover at any rate, an “explosive new science fiction thriller” set in the fun-packed world of astrophysics. I have some acquaintance with this world, given that the Book God’s predecessor was a Natural Philosopher with an interest in such things. That’s probably where my interest in factual science comes from – I refuse to give him all the credit for my interest in science fiction – I lay that at the door of my English teacher in junior secondary school who had us reading Arthur C Clarke’s A Fall of Moondust. Anyhow, we are in Hawaii with the astronomers and astrophysicists and there is an anomaly in the heavens, moving the way such things should not. Turns out to be a sentient black hole heading Earthwards – I’m not giving anything away here, a casual glance at the blurb on the back of the edition I have gives away this key plot point. But what does it want and what is the world going to do about it? This was a bit of a guilty pleasure – I quite enjoyed it while feeling all the way through that I shouldn’t. I think this is because it read very much like it was aiming for the screen, probably as a Sci-Fi Channel mini-series with all the things you would expect. Is there a crumpled deskbound hero scientist who would love to do real work again? Is there a wonderfully intelligent woman suffering from a terminal disease but working through her pain? Is there a rival of long-standing who turns out to be an ally as they all work towards a common goal? Is there tragedy, betrayal and a noble sacrifice? You bet. I don’t mean to make fun because I did actually enjoy reading this, it was quite pacy and there was a lot of hard science which is one of the things I really enjoy. But in the back of my mind I was casting the movie, and that’s always a bit distracting.